House of Fraser recently got in touch with me to ask if I'd be interested in sharing some boards about how I'd like to decorate for Christmas, and since you all know I am obsessed with Christmas I couldn't possibly say no! In the first board above I decided to concentrate on the tree. A good tree is one of the most important parts of Christmas for me and House of Fraser have an excellent range. Since, like every other blogger in the world, I have a white theme running through my home this flocked tree (which currently has money off btw!) would fit in perfectly in there. To try and make sure my theme of silver and metallics isn't too cold I'm also incorporating touches of champagne gold - to make the gold tone is it does have to be a cooler tone and this frosted looking gold apple decoration is gorgeous. It's a box of 12 as well and you do always need a good set of bulk basic decorations to create the backdrop for your special ones. Another set I've chosen for bulking it out is this set of 16 Linea Shatterproof Baubles - it looks like you get 4 of each type of design in this pack, which is great as it bulks out your tree with more basic decorations without begin too obvious you've bought a multi-pack! It's not quite such a bulk-er out-er, but this set of 2 Ballet Dancer Tree Ornaments really caught my eye. I used to do ballet as a child and seeing The Nutcracker at Christmas in nEW york is definitely one of my best Christmas memories, so these feel like a really beautiful, personal addition to the tree for me. Another really personal addition for me would be this The Snowman Bauble from John Lewis. I think this is just beautiful and I have such fond memories of having The Snowman on video and watching it over and over again - and not just at Christmas! The last four additions to the tree aren't quite as personal but they're all incredibly beautiful! 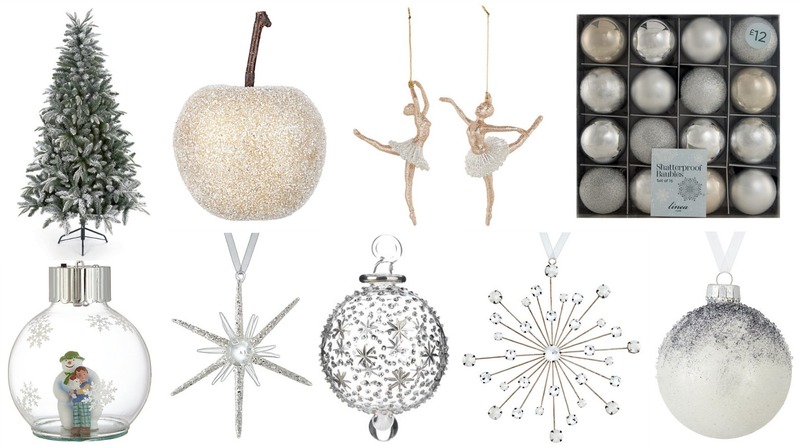 tHIS Glitter Snowflake Bauble is gorgeous and the Jewelled Metal Snowflake Ornament is just so elegant. A lovely addition to the tree. A little bit more pricey is this jewelled ornament - it's from Harrods and for me Christmas just isn't complete without a little something from Harrods, though usually it is a food hamper these days! It's definitely one that would be treasured for years to come! And lastly there's this Snowdrift Ornament, which I have no need for but it's just gorgeous, so I couldn't resist! There's little point in having a lovely tree and not decorating the rest of the house (and yourself!) so I thought I'd make up a second board showcasing some of my other favourite picks. No matter what theme you're going for or which area of the house you're looking to decorate House of Fraser has a massive choice - definitely something to suit all! For dressing the table I've picked out this gorgeous Tabletop Tree, which again has those cool gold tones - which will warm the room up a little more than just a frosty white and silver theme but without seeming too warm. It's also nice for a centrepiece for a Christmas dinner as it's pretty but without blocking the view of those across the table from you - some centrepieces can be beautiful but a little too dense for practicality! For the background decoration there is this gorgeous Advent Calendar - these are an investment that can be used year after year and filled with whatever you fancy. These sea salt caramel truffles would be right up my street - though I'm not sure I would have the willpower to only open one door a day! The Diptyique Ambre Candle is a beautiful candle at any time of year but its warming scent is particularly nice at Christmas! The Candle Holder is also lovely, though it's evidently for tea-lights rather than big candles. When will Diptyique bring out tea lights?! Until they do the Yankee Candle Season of Peace tea lights will be filling my tea light holders! When it's getting colder outside it's nice to have something to snuggle up to so this Grey Throw and the Neutral Throw would definitely give you that - as well as that faux fur adding some beautiful texture to the room! There's something about fur that just looks incredibly luxurious but also really comforting at the same time. So that's me done - I've sorted my Christmas tree, my room and myself - I'm pretty much ready for Christmas! As I've said this post was in collaboration with House of Fraser, but I do only ever work with brands I genuinely like, and I've incorporated the HoF elements in amongst my picks for Christmas from other brands. Frasers is pretty much a Glasgow institution and it's where I went every year to see Santa, so it is always somewhere I naturally gravitate to in the festive season. Love these! 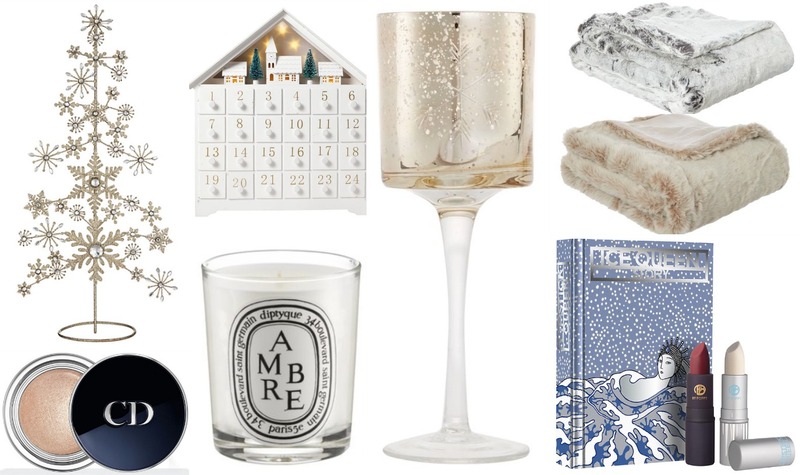 I've been buying little bits and pieces for my tree and home recently, I cannot wait for Christmas! also going for a gold metallically feel. So excited!